A tendon is a band of tissue that connects a muscle to a bone. The Achilles tendon runs down the back of the lower leg and connects the calf muscle to the heel bone. Also called the ?heel cord,? the Achilles tendon facilitates walking by helping to raise the heel off the ground. The Achilles tendon is at the back of the heel. It can be ruptured by sudden force on the foot or ankle. If your Achilles tendon is ruptured you will be unable to stand on tiptoe, and will have a flat-footed walk. It is important to diagnose and treat this injury as soon as possible, to help promote healing. Treatment involves wearing a plaster cast or brace (orthosis) for several weeks, and possibly having an operation. The cause of Achilles tendon ruptures besides obviously direct trauma, is multifactorial. In many instances the rupture occurs about 2-6 cm before its attachment to the calcaneous (heel bone). In this area there is a weaker blood supply making it more susceptible to injury and rupture. Rigid soled shoes can also be the causative factor in combination with the structure of your foot being susceptible to injury. You may notice the symptoms come on suddenly during a sporting activity or injury. You might hear a snap or feel a sudden sharp pain when the tendon is torn. The sharp pain usually settles quickly, although there may be some aching at the back of the lower leg. After the injury, the usual symptoms are as follows. A flat-footed type of walk. You can walk and bear weight, but cannot push off the ground properly on the side where the tendon is ruptured. Inability to stand on tiptoe. If the tendon is completely torn, you may feel a gap just above the back of the heel. However, if there is bruising then the swelling may disguise the gap. If you suspect an Achilles tendon rupture, it is best to see a doctor urgently, because the tendon heals better if treated sooner rather than later. Your doctor diagnoses the rupture based on symptoms, history of the injury and physical examination. Your doctor will gently squeeze the calf muscles, if the Achilles tendon is intact, there will be flexion movement of the foot, if it is ruptured, there will be no movement observed. Treatment of a ruptured Achilles tendon is usually conservative (non-operative) in a Controlled Motion Ankle (CAM) Boot or it may require surgery. The current consensus based on research is to treat them conservatively since the functional outcome and chance of re-rupture is similar (7% to 15%) using both approaches but surgical intervention has a higher risk of infection. Achilles tendon surgery is usually considered if your Achilles has re-ruptured or there is delay of two weeks between the rupture and the diagnosis and commencement of conservative bracing and treatment. Surgical correction of the ruptured tendon is almost always necessary. Surgery is performed in order to regain the maximum strength of the Achilles, as well as the normal pushing off strength of the foot. The strength of the muscle depends on the correct tension between the muscle and the tendon. The only way the correct tension on the tendon can set is by accurately repairing the tendon ends. When the tendon ruptures, the ends of the tendon separate and multiple little strands of the tendon are present like pieces of spaghetti. There are old fashioned techniques for repairing the tendon which require very long incisions (eight inches) on the back of the leg. These are complicated and associated with a high incidence of infection in the skin after surgery. This is an important consideration, since infection in the skin can lead to devastating problems with the skin and tendon. This problem of skin infection has, in the past, led surgeons away from surgical methods of treatment. Fortunately, now there is a new, unique method available for operating on and repairing the tendon. This new method requires only a tiny incision of one to two centimeters in length. This is far more accurate surgery. Recovery after this procedure is easier and the surgical complication rate is extremely low. 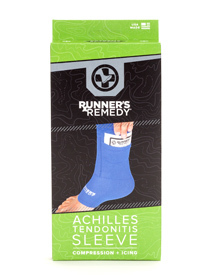 The best treatment of Achilles tendonitis is prevention. Stretching the Achilles tendon before exercise, even at the start of the day, will help to maintain ankle flexibility. Problems with foot mechanics can also lead to Achilles tendonitis. This can often be treated with devices inserted into the shoes such as heel cups, arch supports, and custom orthotics.